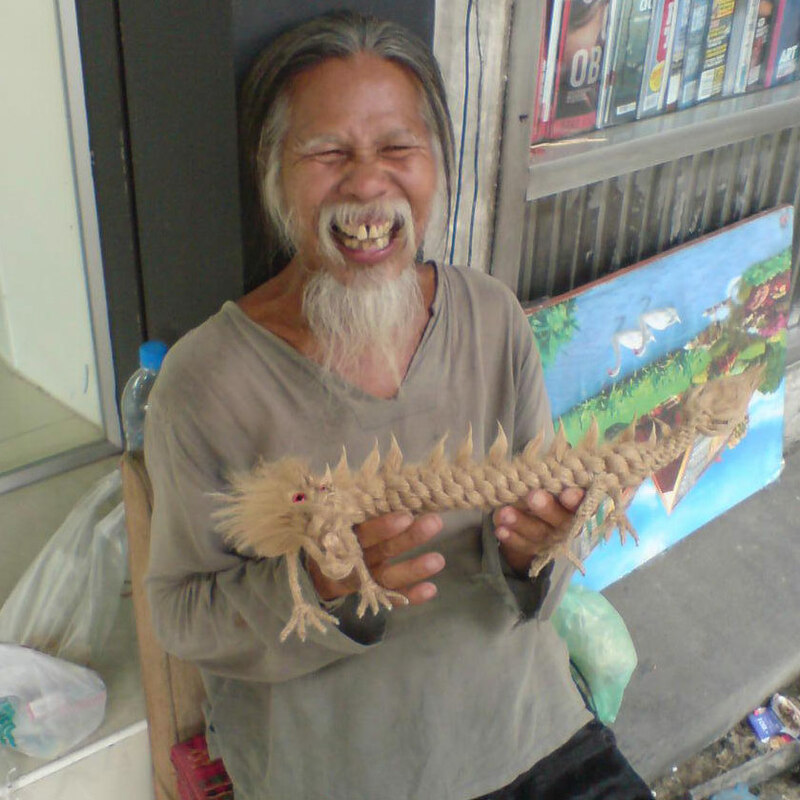 A six-fingered dragon made of rope (2008). I wrote some of The Knot-Shop Man while I was in Bangkok, Thailand, where I would regularly walk past this friendly artist who made rope animals for the tourists. We’d known each other by sight for maybe a couple of years before I asked him to make a six-fingered dragon for me, and after an appropriate delay (two or three months, I think; I thought he’d perhaps forgotten), he excitedly revealed it to me. He was especially amused by the commission because his Chinese name meant “Six”. (The dragon he’s holding in the second photo is not the one he made for me; instead, that one has the regular — but imperial, if you know your Chinese dragon digit allowances — quota of five fingers). 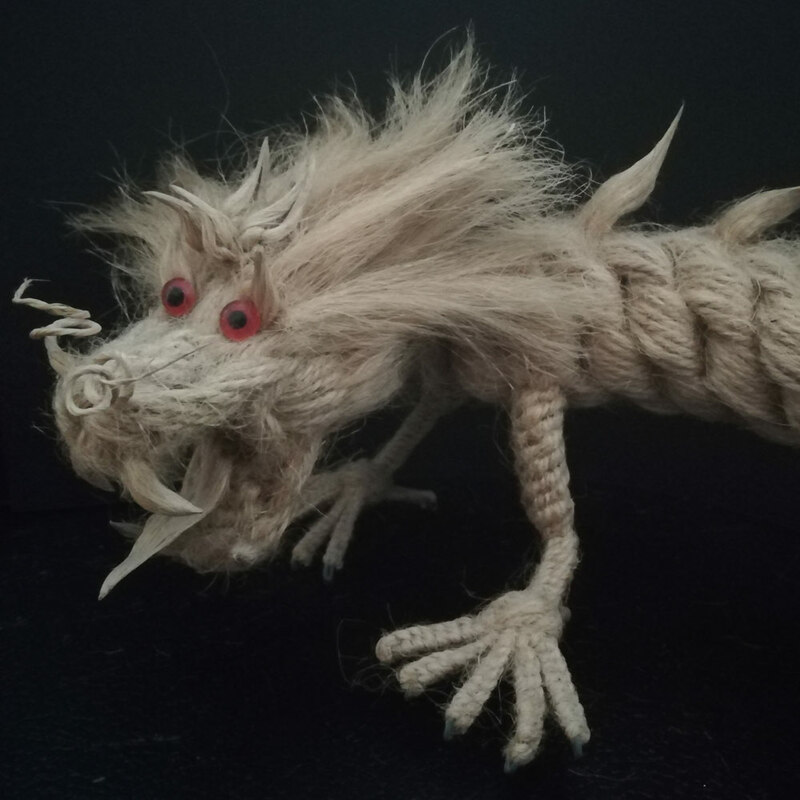 The six-fingered dragon is a very specific motif in the Knot-Shop Man stories, and having one made of rope is an excellent and unique souvenir of that time. Yes, a thumb counts as a finger here (and the dragon’s hands/feet have a backward toe which is effectively its thumb — like a raptors’ talons — which I have unskillfully obscured on the nearest of the dragon’s hands in the first photograph). Don’t think I didn’t spend ages wondering about that, that is, does the number of fingers on a dragon’s hand include the thumb? This is exactly the kind of thing I worry about. Ultimately, unequivocally, yes because it’s about the number of digits available for tying knots.